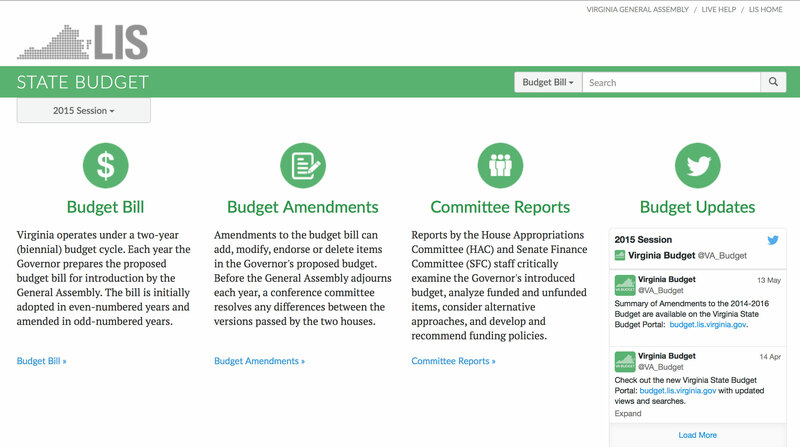 On the homepage, you can select Budget Bills, Budget Amendments, and Committee Reports for the selected session year. Virginia operates with a biennial budget, which means that funds are appropriated over a two-year period. The fiscal year runs from July 1 to June 30 of the next year. So a biennium runs from July 1 of an even-numbered year, to June 30 of the next even-numbered year. Bills and amendments are grouped by biennium. Typically, even-numbered years have data for two bienniums. Odd-numbered years have data for a single biennium.